Many times we get asked about warm roof constructions and how they compare with cold roofs. This signifies a growing generation of customers who want to find new and innovative ways of conserving energy and saving money on household bills. As more and more of us are making the use of outdoor space and adding on flat roof extensions, conservatories, man-sheds, and summer houses, a warm flat roof construction can be just what is needed to keep warm, dry and insulated particularly in the winter months. Basically, a warm roof construction is formed by placing insulation over the top of the roof structure. This means that the timber structure beneath is warm, which is why the term ‘Warm Roof ‘ is formed. This type of warm roof system is highly recommended by architects and specifiers in the UK as it avoids the need for ventilation of the roof structure. It is also one of the easiest ways of insulating a flat roof as none of the existing roof is opened up as a rule. Why does a warm roof avoid the need for ventilation? 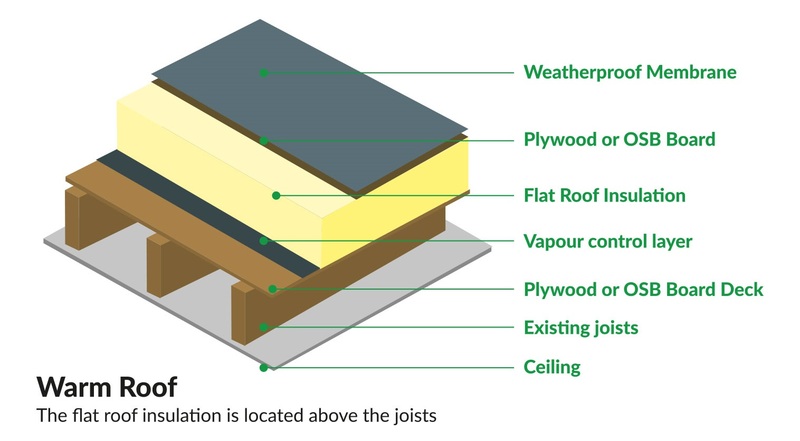 In order to avoid the need for ventilation, a continuous vapour barrier is installed in between the timber subdeck and the insulation layer; this then prevents the movement of vapour and helps to eliminate the risk of condensation. What is a cold flat roof construction? A cold flat roof is where the insulation is placed between the joists under the flat roof, so that the roof and the roof timbers are cold. Did you know that since April 2006, if you are refurbishing 50% of your roof, you are required by law to upgrade the insulation on your flat roof? This is to comply with the conservation of full e-power in existing dwellings – Part L1B regulations. Obviously, complying with this regulation has additional costs as scaffolding is normally required and additional insulation costs. To help you with these extra costs, the government have set up an incentive scheme to help homeowners meet their CO2 emissions targets. They have reduced the amount of VAT you have to pay from 20% to 5% which is a huge saving. This also applies to any other work required as a result of your insulation upgrade. For example, an extension warm roof with new fascia boards, guttering, roof covering and insulation would all be at 5% VAT. Since the energy saving would be significant from a warm roof and depending on the size of your flat roof, you could save around £180.00 in heating costs each year. R&D’s warm roof upgrade is suitable for all the roof systems we offer. The continuous overlay of thermal roof insulation which we install, will help to reduce any cold bridging, or to put it in simpler terms can reduce any pockets of heat leakage. As a result of its insulating qualities, it can be an ideal solution for your roof, and can be overlayed on your existing roof, provided that the timber structure is sound. 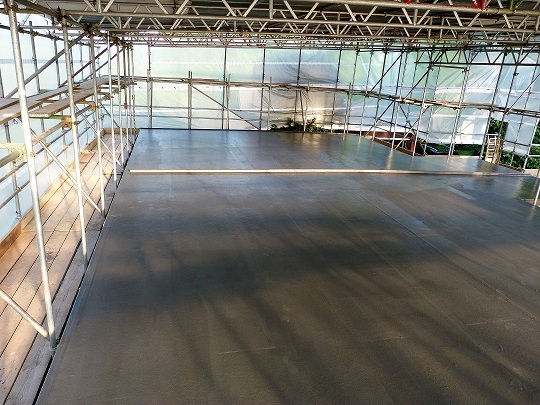 R&D Roofing fit either an EPDM rubber flat roof system or a GRP Fibreglass system. Both of these come with a 20 year guarantee and a much longer lifespan.